This is the first in a series of interviews with businesses having great success using social media. Not the huge brands with tons of money to spend, but ordinary businesses on a budget and with limited resources. We call them the Buzz Makers of Social Media. In this interview Scott Yablon, the CEO of the Gluten-Free Resource Directory shares his success with us. Scott’s Gluten-Free Resource Directory is a comprehensive online resource for anyone interested in a gluten-free lifestyle whether due to Celiac disease, non-Celiac gluten sensitivity or even those who believe that a gluten-free diet is a healthier way to eat. Here’s how he is shaking the gluten-free world with social media. Buzz Accelerator: How did you develop an interest in using social media for your business? Scott Yablon: As the owner of the business I was resistant at first to using social media, but, I was open to testing the waters. Wow, was I ever wrong! Facebook in particular has been an amazing way for us to get the word out to people interested in all things gluten-free! In just one year on Facebook, we had 59,000+ fans and our engagement is regularly in excess of 50%. 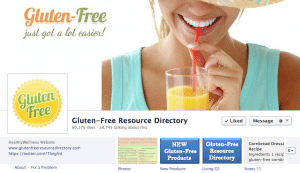 (As of July 28, 2014 the Gluten-Free Resource Directory Facebook page has 161,061 fans). Looking at the Page Ad Data, we are consistently ranked in the leader board rankings in multiple categories. Buzz Accelerator: What is your social media philosophy? Scott Yablon: Here again, as CEO, I just didn’t “get” social media initially. I thought it should reflect what I thought was important and again I was wrong! I realized pretty quickly that our philosophy should be to provide content, information, visual images, etc., of what the fans wanted. When we gave fans what THEY wanted, our engagement increased AND our fans grew. Buzz Accelerator: How important is social media in your business? Scott Yablon: It has been amazing for us. We can keep in touch everyday with our fans/consumers AND we can help our advertisers as well. Buzz Accelerator: What benefits are you are seeing from your efforts, particularly with Facebook? 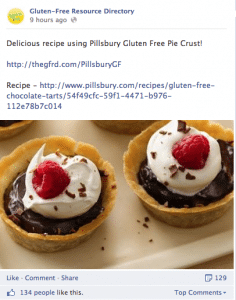 Scott Yablon: Traffic to the Gluten-Free Resource Directory comes from many sources including direct, google, celiac related organizations, bloggers, twitter, pinterest – but Facebook has become a very important source for us. Buzz Accelerator: How much time do you spend on Facebook marketing? Scott Yablon: We have one full time person during the day working on our Facebook marketing and we have others that help answer questions that our fans have for us. Buzz Accelerator: Which social media tools and services do you rely on the most? Scott Yablon: We use the Facebook Insights all the time as well as google analytics. We have recently looked at some other services but have not determined if paying for them is necessary. Buzz Accelerator: How are you measuring the effect of Facebook marketing on your business? Scott Yablon: It is for us, a direct cause and effect. We post information on Facebook and can track the traffic realtime for each post as it hits the Directory. It’s fantastic. Buzz Accelerator: How do you go about finding your target audience on Facebook? Scott Yablon: For us it is very easy because of the very specific group of people we are targeting – those interested in “gluten-free”. Buzz Accelerator: How do you engage your audience on Facebook? Scott Yablon: Many ways – we post, at a minimum, 25 times a day. Some posts are product related, some are news related, some are funny, some are inspirational…we don’t always have a winner, but again, it’s not what I like – it’s what the fans like. We learn from every post. Buzz Accelerator: Are you able to monetize your Facebook efforts? How? Scott Yablon: Indirectly. The traffic coming from Facebook to the Directory drives interest to advertisers and non-advertiser products and that enables us to market the Directory successfully. Buzz Accelerator: What is your company’s Facebook strategy? Scott Yablon: Give the fans WHAT THEY WANT. If we do that, we will continue to grow our fan base and maintain a high engagement rate. Buzz Accelerator: What Facebook tactics have you found to be most effective? Scott Yablon: LISTEN to the Fans, and POST QUALITY information. Whether it is a chart, graph, link to another site for great information, a recipe or just something tho make them smile…THAT’s what is important. We cover health issues, celiac issues, wellness – but we also want Fans to WANT to come back to our page and Directory, so we try to balance everything we do. Buzz Accelerator: Please share with us a particularly successful action with Facebook marketing. Scott Yablon: We asked for help! I know what I don’t know and I wasn’t shy about getting professional help. That got us off to a great start and while I can’t say we are on auto pilot, we have a plan and we execute everyday. Some days are better than others, but we learn from the great posts and we really learn from the ones that bomb. Buzz Accelerator: What are your future social media plans? Scott Yablon: We just began venturing into the twitter world – we will continue down that path, carefully. We are expanding a presence on Pinterest and looking at instagram – but I am not convinced these will really be as beneficial as Facebook – – -BUT, I have been wrong before! If you are a business have great success with social media and would like to share your story, contact us! We’d love to hear from you.